In memory of Dario Pegoretti, here is a look back at a feature story from our March 2018 issue. It’s a regular occurrence in the TPC shop. You see a small circle of employees all huddled together, ogling some bike that’s just come in. The more people in the circle, the hotter you know the bike is going to be. At the center of these bike-nerd attractions, it’s often one of the usual suspects—an ultralight carbon race machine decked out in Enve and Di2, a custom American-made titanium rig or a blinged-out mountain bike with $8000 worth of suspension. The first time we saw a bike built with SRAM eTap, everyone in the shop had to come around, give the shifters a tap and subsequently praise wireless shifting or claim that it was the harbinger of some Terminator-style Judgment Day for cycling. Bike nerds always have opinions. Bike tech is the greatest source of drooling and discourse within the walls of The Pro’s Closet. Countless hours are productively spent debating the advantages of 2.5mm of crankarm length, dipping your chain in paraffin wax, tire pressures and an endless number of similar, inane technical hang-ups. 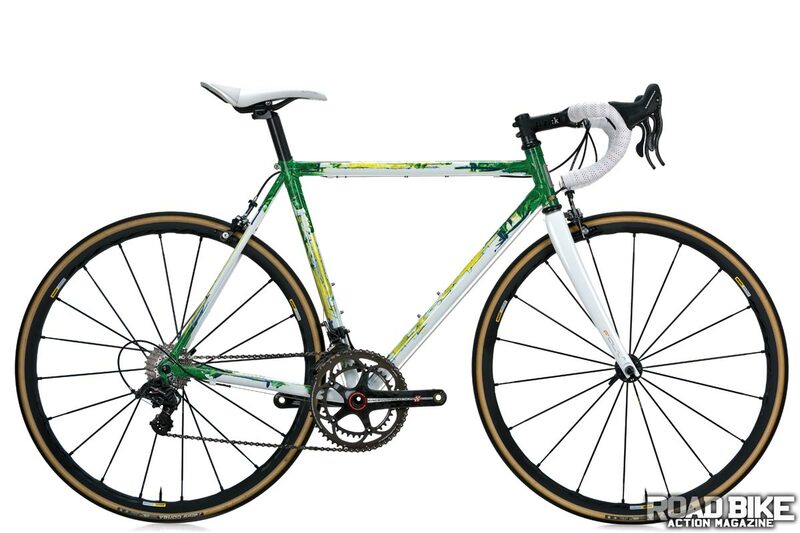 Maybe that’s why I was so surprised when this green-and-white Pegoretti road bike came rolling into the shop. As usual, a crowd gathered, everyone asserting their lustful eyes upon its lovely form. But, not once did anyone mention anything about its tech. No, instead the conversation turned towards something surprising, something most bike nerds have much less experience discussing—art. It reminded me of a scene in one of my favorite TV shows, Mad Men. A group of employees hear that their boss has purchased an interesting modern painting for the exorbitant amount of $10,000, and out of curiosity they sneak into his office to see the painting and find a Rothko, an iconic example of abstract impressionism. In that moment, when they first see the painting, you can see how immediately their opinions and emotions are split. They ranged from confusion to indifference to comic criticism and even unexpected empathy. That’s exactly the scene I saw gathered in the shop around the Pegoretti. Not a single person mentioned the Campagnolo Super Record gruppo. No one espoused the virtues of steel or its unparalleled ride quality. There wasn’t a single quip about how the Mavic wheels were annoyingly not Italian like the rest of the bike. Instead, all attention immediately became focused on the Pegoretti’s most distinguishing feature—its paint. Most people argued about whether or not the bike was good looking, and the prevailing opinion was solidly mixed. A few passed by without a second glance. Some declared they’d never own such a horrid-looking bike. Others gushed over its striking neo-expressionist beauty and called its detractors Luddites. And then there was me, alone and confused. I was in the position of Mad Men’s Harry Crane who, when asked what he thought about the Rothko painting, said, “I know nothing about art.” When asked what I thought of the bike, I simply froze and stuttered out an awkward, “Well, it’s a bike,” then quickly walked away. The thing about a Pegoretti is that they fall into a unique, subliminal space between a practical racing machine and artistic showpiece. On the head badge are the words “Fatti con le mani” made by hand. 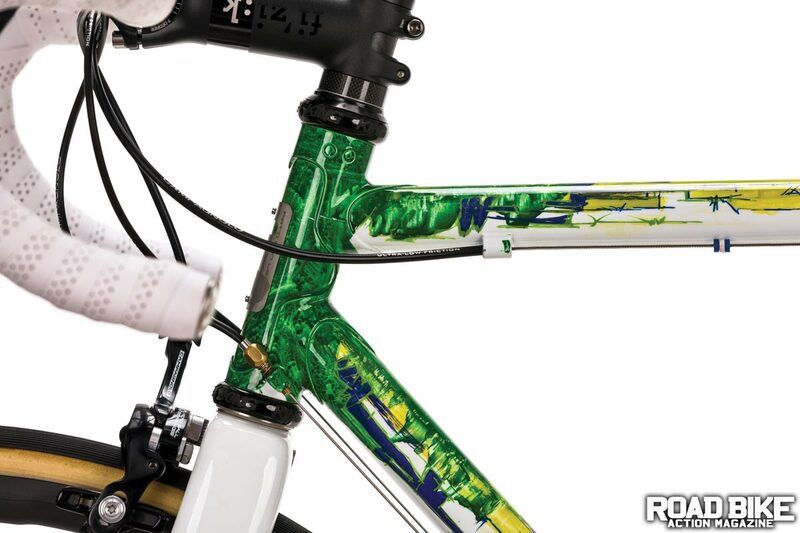 Each frame is skillfully hand-built in Dario Pegoretti’s workshop in Verona, Italy, and nearly all feature paint jobs that look like they belong in a modern art exhibit. Dario is an artist who also happens to be an incredibly skilled builder. Steel bike frames are his canvas of choice. His workshop has the feel of an artist’s studio. The walls have exposed brick covered with paintings and doodles. Cigarette smoke lingers in the air, along with the sounds of jazz and classic English rock played through vintage tube amps. An entire corner of the workshop is dedicated to the paint studio. Here Dario hand-paints the unique frame designs for which he is so well known. Each paint scheme he offers customers has its own idiosyncratic name. Names like Thelonious, which pays homage to the jazz great Thelonious Monk with piano keys and musical bars that wander across the frame, or Catch the Spider, referring to Dario’s own battle with cancer (which he called a spider within his body), features bright radioactive colors representative of the chemotherapy he underwent. The Day Is Done bike, which is named after a song written by late English singer/songwriter Nick Drake, features his striking Ciavete paint scheme. Each Ciavete bike is hand-painted in a neo-impressionist style inspired by American artist Jean-Michel Basquiat. The process takes over a day to complete, and the colors and graphics are chosen at Dario’s discretion. By ordering one, you essentially give Dario artistic license to paint as he wishes, in the moment, as his wild-at-times inspiration and emotions dictate. Each Ciavete is a one-of-a-kind item. With this bike you can see the thick lines of individual brushstrokes in the green paint underneath the clear coat, the places where Dario drew a painter’s knife across the yellows to create a Venezia stucco look, and the spots where he would let a bead of blue paint run, nudged on across the tubes with the help of gravity and a few blasts of air from a compressor. In my attempts to understand what I was seeing, I sat with the bike at my desk just staring at the colors. One early morning, in a transcendent bout of coffee-fueled hallucination, I began to think maybe I was able to feel what Dario was feeling the day he painted the bike. I can’t exactly put it into words, but I can almost see it. The yellows, greens and blues come together to produce a crisp morning in early spring, the sun just beginning to cut through the early-morning mist, cigarette smoke drifting from Dario’s mouth as a green-flamed torch lifts from the frame, the final piece of brazing complete. The sun rises and wakes the city while Dario sips an espresso, and deeply content in the warm brightness of a new day, he preps the Day Is Done for paint. He puts a bebop album in the record player and suddenly, in a manic episode, he begins expelling the colors of his springtime joy, laughing while he flings paint from tubes and brushes, letting impulse drive his brush and painter’s knife in a two-handed dance up and down the frame. He smiles, and by the time the sun sets, he applies the final clear coat to his newest creation. It’s a rather dramatic imagining on my part, but the Italians are known for passion after all. It’s part of the magic a bike like this just exudes. 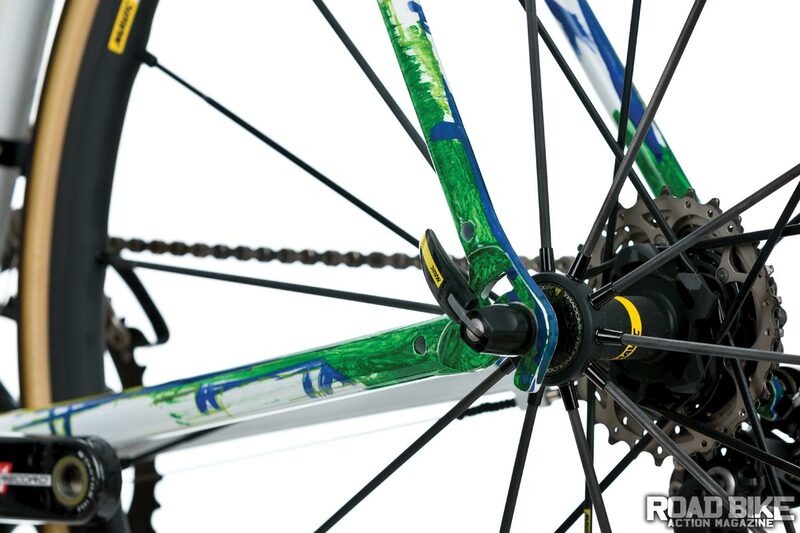 But Pegoretti bikes are also more than just stunning paint jobs. In a world with thousands of builders, all talented and praiseworthy, Dario has something beyond his bohemian artistic character that sets himself apart from everyone else. Pegoretti has designed and built bikes for several famous racers, including the likes of Miguel Indurain, Marco Pantani and Marco Cipollini. Part of the legend and mystique of Pegoretti also stems from the secrecy surrounding the specifics of what brands and riders he has built for. Dario himself tends not to talk about it, and certain contracts may actually prevent him from doing so. But, plenty of keen bike nerds have done the detective work and are able to speculate that iconic bikes such as Pantani’s Pinarello and Tom Boonen’s 2007 Tour de France Specialized were really re-badged Pegorettis underneath. He’s been doing this sort of work since 1975 when he started frame building in his father-in-law Luigi Milani’s frame factory in Verona. Apprenticing under Milani, he helped produce frames for legendary road racers like Roche, Battaglin, Chiappucci, Indurain, Tafi, Fondriest and many others. When his father-in-law passed in the ’90s, Dario continued on, building for various brands as a contractor just to get by until Giorgio Andretta (founder of Gita Imports, an American distributor) convinced him to venture into producing frames with his own name on them. Thus, the Pegoretti brand began, and he’s been building his own frames ever since. He’s built bikes for many other famous clients, like the late Robin Williams, who loved his bikes so much he ordered three for himself and gave others away as special gifts. Demand for Pegorettis by collectors and enthusiasts is now so high that it has caused Pegoretti to develop a reputation for incredibly long lead times and limited communication. The original owner of this Day Is Done experienced this firsthand. He saw Dario’s work at the North American Handmade Bicycle Show in 2010 and immediately decided to order a bike. Dario has fit some of the best bike racers in the world, and his method is decidedly old school. With a tape measure, he determined the client’s geometry in a few minutes and wrote some brief notes to himself on an order form for the client to fax to his workshop in Italy through a dealer. There was no hype, no marketing and no guarantee when the frame would be done. Ultimately, the client didn’t take delivery of the Day Is Done until a staggering six years later. The funny thing was that the lead time was so long that the client actually forgot he had ordered the bike. In the interim he had already purchased two more Pegorettis through other channels. The Pro’s Closet received this Day Is Done simply because the owner couldn’t justify keeping all three, and the newest one would fetch the highest price. It was a sad and painful parting, not only because the Day Is Done is visually striking, but because it is also one of the most modern and advanced bikes that Pegoretti has produced. 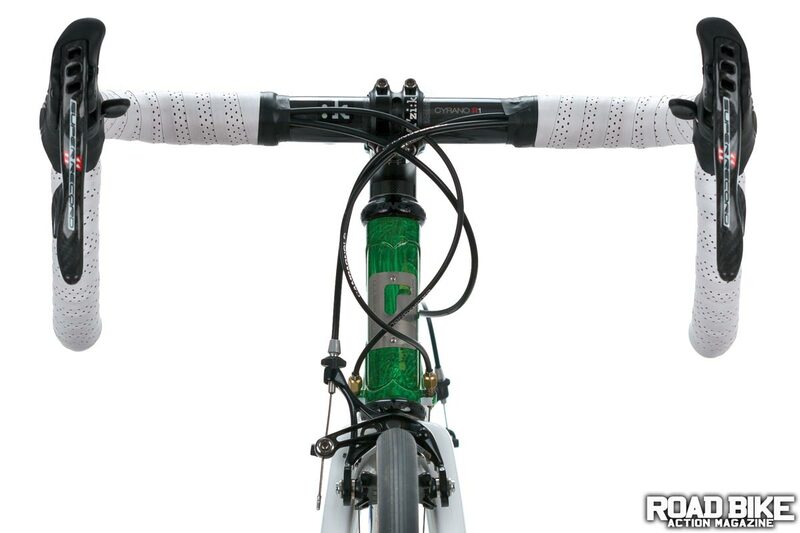 It’s built with heat-treated Columbus Spirit Niobium steel tubing, which is exclusive to Pegoretti, and was developed closely with Antonio Colombo himself. It’s one of their lightest tube sets and specially optimized for lugged construction. Dario was one of the first European builders to embrace lug-less, TIG-welded frames for premium bicycles, but for the Day Is Done, he chose to produce a lugged frame. Building with lugs is a more gentle and time-consuming process than TIG welding. After each tube is cut and milled, it must be fit to a hand-tapered lug and silver-brazed together at a relatively low temperature ranging from 600–900 Celsius. Because of the low temperatures, the brazing process creates an extremely strong, compliant and easily repairable frame. For many, a lugged frame is also the pinnacle of steel bike construction and aesthetics. At the other end of the bike he uses his own custom carbon fork called the Falz, which he designed as a replacement for his favorite Reynolds Ouzo fork, which is no longer produced. He looked into other options, such as Enve, but all the quality candidates were unavailable in rakes that suited his designs. The Falz fork has exceptional lateral stiffness and a look reminiscent of a traditional flat-crowned fork. The wide, bulldog-like stance allows for longer fork legs, which, with the flat crown, improves compliance despite the fork’s high lateral stiffness and also provides clearance for wider tires. The whole thing is finished off with a Fizik cockpit and saddle on a lightweight WR Compositi seatpost. The only non-Italian bits on the bike are the alloy Mavic Ksyrium Pro wheels. Ultimately, the bike has seen little to no use on the road, which is a shame, because the Day Is Done is one of the finest modern steel bikes made. It’s comparable to its carbon counterparts in weight and comfort, and it perfectly represents one of Dario’s core beliefs that a good steel bike should acknowledge the past but still have ample performance. Or, perhaps it’s better that the Day Is Done never touches the road, if only to preserve its artistic value. I can only imagine how heartbreaking the first chip or scratch in its paint would feel. Fortunately, I don’t have to decide or agonize over what to do with the bike. As with any work of art, there are those who can truly appreciate a piece and some of those lucky few who can afford it too. The Day Is Done sold quickly and has been packed and shipped to its new home in Belmont, California. The buyer is an avid triathlete and cyclist who’s had his eye on owning a Pegoretti for years. When the Day Is Done first appeared on The Pro’s Closet website, he saw the paint and knew it had to be his. In the San Francisco area where there are nice bikes abound, the Pegoretti will surely stand above all else. It will be ridden only on beautiful days, and the new owner says that he may have to get some Italian wheels to complete the package. I’m happy for him, and whatever life the Day Is Done has after leaving The Pro’s Closet, I hope it lives well and is cared for. Through all my research into Dario Pegoretti—reading about him and watching interviews, lectures and videos of his frame-building classes—I’ve come to know and understand him and his work in a way I couldn’t when I first saw the bike on its own. He’s a man with boundless passion and skill. A man who loves using his hands and making beautiful things. I look at the Day Is Done and all the other bikes Dario Pegoretti has built, and I can see myself one day finally letting go and falling in, forgetting things like technology and performance, forgetting what my co-workers say in their bike-judging huddles, and just getting on to experience a beautiful ride, on a beautiful machine. No bike has ever challenged me aesthetically and artistically like this has. I stare into the colors and see something I can’t fathom or understand. It’s unlike any bike I’ve known, not just in appearance but—and I know this sound crazy and ridiculous—in aura as well. As I try to analyze it and reconcile all my conflicting opinions about the bike, it all feels pointless. Editor’s note: This is part of a continuing series from The Pro’s Closet featuring bikes from the past and present that deserve a spotlight, either for their place in history, their technical merits or simply because we think they’re special. Besides creating a museum of vintage race bikes, The Pro’s Closet is the top shop for the resale of quality pre-owned bikes, parts and valuations.